Studies showed that ex vivo expanded HSCs cure genetic defects in allogeneic mice where freshly isolated HSCs transplants fail. 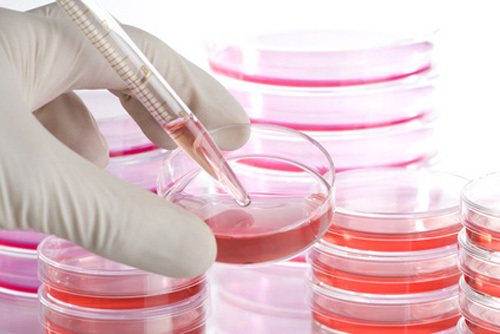 Researchers claim culturing hematopoietic stem cells (HSCs) in the lab for a week or so before transplantation into an allogeneic recipient markedly improves engraftment success while reducing rejection issues. Studies in mice showed that expanding mouse HSCs ex vivo for eight days led to a 40-fold increase in allograft ability (compared with freshly isolated HSCs). The team says the results are due both to increased numbers of engrafting HSCs and a culture-induced increase in expression of the immune inhibitor CD274 (B7-H1 or PD-L1). In vivo experiments led by University of Texas Southwestern Medical Center and Yale University School of Medicine demonstrated that the CD274-overexpressing expanded HSCs could cure a normally lethal genetic defect in mice. Encouragingly, subsequent studies showed that cultured human HSCs also demonstrate elevated CD274 expression and can suppress the proliferation of allogeneic T cells. The team suggests their findings will shed new light on the immunology of HSCs and other stem cells. In 2008, Dr. Zhang’s group reported on an efficient culture system for ex vivo expansion of HSCs, which has since been used by a number of groups to expand mouse and human HSCs for transplantation or genetic modification purposes. Two key features of the system are the increased number of repopulating HSCs, and the change in surface expression of a number of proteins. The UT Southwestern researchers’ latest work investigated the hypothesis that ex vivo expansion of HSCs may also modulate the cells’ immunological properties and increase their ability to cross the immune barrier when transplanted into allogeneic recipients. Using a well-established mouse model for fully allogeneic transplantation, the team compared the allograft abilities of freshly isolated and ex vivo expanded HSCs transplanted into lethally irradiated recipient animals. The expanded cells were cultured for eight days in the previously reported culture system. While 1,000 or more freshly isolated HSCs were required for successful allograft, the cultured progeny of only about 50 or so input equivalent HSCs were required to achieve the same level of allograft. Both fresh and cultured HSCs were capable of multilineage differentiation in the recipient animals, and there was no evidence of graft-versus-host disease (GvHD). To ensure that recipient mice survived after transplantation and thus allow better quantitative evaluation of the allograft abilities of different donor cells, the team performed allogeneic transplantation by including competitors in the form of total BM cells freshly isolated from the same type of mice as the recipients: These cells provide short-term radioprotection and serve as internal controls but do significantly enhance the host immune rejection and make donor engraftment more difficult, the authors note. Using this technique even 10,000 freshly isolated HSCs failed to engraft in recipients in the presence of competitors, while their cultured progeny did readily engraft and repopulate lymphoid and myeloid lineages. Testing the benefits of HSC expansion in a third transplantation model, the researchers transferred freshly isolated and ex vivo expanded HSCs into mice with sublethal irradiation. Again the ex vivo expanded HSCs achieved markedly increased allograft success compared with their uncultured counterparts. Significantly, equivalent results to those in the three initial transplantation models were achieved when different donor/recipient strains of mice were used or when the freshly isolated and expanded HSCs were co-transplanted in the same recipient. “All these results indicate a dramatic enhancement of allograft ability of HSCs after ex vivo expansion,” they state. Using limiting dilution analyses and associated calculations the team calculated that ex vivo expansion led to 11-fold increase of HSC numbers but a 40-fold increase in allograft ability: For freshly isolated donor HSCs the frequency of allograftable cells was 1/43,818, whereas the frequency among the cultured cells was 1/945 input equivalent cells. This finding suggested that the benefits of expanding HSCs in terms weren’t just as a result of increased cell numbers, as another factor associated with the cultured cells was responsible for about a fourfold increase in the ability of the cultured HSCs to engraft. Supporting this notion, the team found that transplanting HSCs that had been cultured in a medium designed to maintain the cells without expansion did, indeed, still result in a fourfold increase in allograft ability compared with freshly isolated HSCs. The next stage was to evaluate what it was about culturing that improved the ability of HSCs to cross the MHC barrier and engraft. Studies strongly pointed against any involvement of accessory cells produced during the culturing process, so the researchers instead looked for differences in the expression of surface immune proteins on freshly isolated and cultured HSCs. What they found was that culturing led to a significant increase in the numbers of CD274+ cells and, importantly, a new population of cells that demonstrated a 10-fold increase in CD274 expression. CD274 is a member of the B7 family of immune proteins that is expressed or induced on dendritic cells or nonantigen-presenting cells and inhibits T cell or innate activation. Interestingly, the researchers found that that CD274 upregulation in HSCs occurred under different culture conditions that didn’t promote expansion, suggesting that the increase in CD274 expression was induced by general proliferation signals in culture and was independent of HSC expansion per se. The importance of CD274 expression on HSC allograft success was confirmed by studies in mice using cultured, CD274-null HSCs. These HSCs demonstrated significantly decreased long-term repopulation in competitive allogeneic repopulation studies when compared with wild-type HSCs. Similarly, cultured anti-CD274 neutralizing antibody-treated wild-type HSCs also lost their donor allografting capacity. To distinguish between the possible involvement of a T cell-mediated immune response and innate immunity in cultured HSC-enabled allografts, the team cultured both wild-type and CD274-null HSCs in the expansion medium and transplanted the resulting cells into sublethally irradiated SCID mice that have no functional T cells or B cells but do produce normal natural killer cells. There was no difference in the level of allograft repopulation by the transplanted wild-type and CD274-null HSCs, suggesting that CD274 mainly works through suppressing allogeneic T cell activation but not innate immunity, the authors write. They moved on to evaluate whether ex vivo expanded HSCs could be used to cure genetic diseases. Expanded cells were transplanted into a mouse model that demonstrates defective HSC self-renewal and normally dies about a month after birth. Whereas freshly isolated HSCs transplanted along with helper cells only engrafted in about 1/9 recipients, their cultured progeny successfully engrafted and rescued all recipients. These mice demonstrated almost 100% donor reconstitution, and lymphoid, myeloid, and erythroid lineages were repopulated by four months post-transplantation. Encouragingly for future potential clinical applications, cultured human HSC populations also demonstrated increased numbers of CD274+ cells and levels of CD274 expression. Mixed lymphocyte reaction analyses further showed that the elevated CD274 expression on cultured human cord blood HSCs suppressed the proliferation of allogeneic T cells, and this ability was inhibited by treatment with an anti-CD274 neutralizing antibody. Transplantation studies with cultured human cord blood HSCs in immune deficient mice also showed the cells demonstrated enhanced ability to engraft. In this case the ability to engraft was not affected by an anti-CD274 neutralizing antibody. Similar to results with mouse HSCs transplanted into sublethally irradiated animals, the human HSC transplant studies suggested that human CD274 suppresses allogeneic T-cell activation but not innate immunity.